A good stabilizer prolongs the life of your machine embroidery projects, helps keep the stitches intact, and keeps your sewing machine running smoothly. Stabilizers play a key roll in producing professional looking embroidery designs. But how do you choose the right stabilizer for each project? Take the mystery out of stabilizer package labeling and end-uses for the general groups of stabilizers. Extensive charts correlating fabric type to stabilizer types are in my book, Stabilizers—The Foundation Guide Book. Read more details expanding on today’s blog post in the book. As we go forward, I’ll be talking about stabilizers used in machine embroidery. Stabilizers and interfacings for garment sewing will be a blog post for another day. Most manufacturers have their stabilizer packaging color coded into these categories, as well. In the book, you’ll find each of these sections is also color coded. How dense is my stitching design? What is the end use of my project? How is my project fabric laundered? How long will this embroidery project be used? Is my embroider area difficult to hoop? Does my fabric have a nap or pile? Generally speaking, lightweight stabilizers are used for lightweight fabrics with fewer stitches in the embroidery design. Heavyweight stabilizers are used with high stitch count embroidery designs on medium to heavyweight fabrics. Test swatches are always recommended as the heavier the stabilizer, the more fabric drape and integrity will be affected. Choose adhesive spray such as 505 spray or an adhesive stabilizer if your project is not easily hooped. As with anything, the more you practice embroidery and the more you know about the products, the easier it will be to choose the stabilizer best for your projects. As a general rule, if a fabric stretches, use a cut-away stabilizer. These stabilizers are permanent, resist stretching, and remain on your fabric for the life of the project. The area of stabilizer that remains under the stitches after trimming offers continued support to the embroidery design through laundering and wearing. Cut-aways eliminate pulled or sagging stitches, and are excellent stabilizers to use on knits, dense embroidery designs and open weave fabrics. Note from Nancy: Trim stabilizers about 1/4″ from the design. Trimming too closely may cause the design to pucker at the edges. Leaving too much stabilizer causes an indentation on the right side of the fabric around the design. Translucent textured nonwoven (lightweight)—Semi-transparent stabilizer resists stretching, eliminates show-through, and is comfortable next to skin. Fusible Mesh Cut-Away Stabilizer (lightweight)—This stabilizer is applied with a low temperature iron, and it ensures fabric will not shift while embroidering. Nonwoven (medium weight)—This category of stabilizer provides optimum support and eliminates pulling or sagging of designs. It can hold adhesive spray or fusible web for hoopless embroidery. Iron-On Nonwoven (medium weight)—Applied with a low temperature iron, this stabilizer ensures fabric will not shift during stitching and eliminates the need for additional adhesive products. This stabilizer is somewhat soft and flexible. Water-activated adhesive nonwoven (mid-heavyweight)—Hoop the stabilizer, moisten with a damp sponge, and apply the fabric to the stabilizer. It will not leave gummy residue on your project. Nonwoven (heavyweight)—This stabilizer resists washing damage and shrinkage, and it provides optimum support for heavy duty projects. Iron-on textured crisp nonwoven (heavyweight)—This heavyweight permanent stabilizer has a soft hand and excellent stability. It has a permanent fusible coating and is ideal for projects that need extra stiffness and retained support. Tear-Away stabilizers are best used with woven, nonstretch fabrics and are temporary. The fabric is stabilized during embroidery and after stitching is completed, the excess stabilizer is torn away from the design. Unlike cut-aways, most tear-aways may deteriorate after repeated washing. If you are using multiple layers of tear-away stabilizers, remove each layer separately to minimize stress on stitches. Tear-away stabilizer is commonly used in a float. A float is an additional piece of unhooped stabilizer placed between the fabric and hooped stabilizer. It provides additional support to stitches and is easily removed. Note from Nancy: When removing stabilizer, place your thumb on the edge of the embroidery stitches as you tear away the stabilizer. This will alleviate unnecessary and damaging stress on the stitches and the fabric, plus you will get a closer removal of the stabilizer. Iron-on translucent film (very lightweight)—This opaque film turns translucent after applied to fabric with a low temperature iron. Nonwoven (lightweight)—This stabilizer provides good stability with effortless removal. Iron-on nonwoven (lightweight)—Fusible and handy to support stitches without shifting, sliding, or puckering. This stabilizer is recommended when pairing stabilizers for the float technique. Fusible/adhesive nonwoven with release liner (lightweight)—This double-sided adhesive stabilizer is ideal for appliqué designs. Iron the fusible side to the back of the appliqué fabric, remove the liner to apply, and stitch. Flame retardant nonwoven (light-midweight)—Nonflammable stabilizer is made of 100% polypropylene. Perfect for embroidering children’s sleepwear. 100% cotton nonwoven (light-midweight)—100% cotton nonwoven is soft and gentle to the touch, yet strong and firm for hooping and stitching. This stabilizer is extremely comfortable against the skin. Nonwoven (midweight)—Nonwoven is an excellent all-purpose stabilizer; soft to the touch, strong enough for hooping and stitching. It is a good stabilizer to choose when using the float technique. Iron-on nonwoven (midweight)—This product eliminates the need for additional fusibles or adhesives and holds projects taut and straight while stitching. Tear-away disintegrating nonwoven (midweight)—This stabilizer disintegrates in the wash. Simply tear off the excess, and any additional bits that were not removed will be eliminated over time in the laundry. Colored vinyl (midweight)—Use this unique stabilizer to prevent the base fabric color from showing through the embroidery stitching. It prevents embroidery from sinking into high nap fabrics and gives a 3D lift. Adhesive stabilizer with release paper (midweight)—Eliminate hooping your fabric when you use this eco-friendly adhesive stabilizer with release paper. Nonwoven (heavyweight)—This very heavy stabilizer is surprisingly soft, pliable and easy to tear away. Be mindful to not pull the stitches when tearing this product from behind your design. Water-activated adhesive nonwoven (heavyweight)—Only hoop this dense stabilizer as it eliminates the need to hoop the fabric. After moistening the stabilizer with a sponge, the fabric will stick! Wash-Away stabilizers are best used on specialty fabrics, various fabric weights, and unique embroidery techniques. Make sure your fabrics are washable before using wash away stabilizers. Wash-Away stabilizers can become brittle and dry when exposed to air, and in humid conditions the may begin to dissolve. Store them in airtight containers to help keep them pliable. Soak the fabric in water. This is best for heavyweight wash-away stabilizers. Mist the stabilizer using a spray bottle. Misting is best for lightweight wash-away stabilizers. Massage stabilizer under warm running tap water. Adhesive wash-aways may require this treatment. Water-soluble web (very lightweight)—Use this stabilizer to prevent stitches from sinking into pile fabrics and prevent loops from pulling on knitted or napped fabrics. Transparent film (very lightweight)—This eco-friendly stabilizer leaves no residue after washing and can be removed by misting with water or blotting with a damp sponge. Water-soluble fabric (lightweight)—Water-soluble fabric looks like a sheer fabric but it will actually wash completely away. It is easy to hoop and is very stable. Transparent film (lightweight)—This film is twice as heavy as the very lightweight transparent film and will require more water for removal. Water-soluble nonwoven (midweight)—This stabilizer is soft and flexible. It is easy to cut, handle, and hoop. It looks and feels like mesh cut- away but completely washes out. Adhesive water-soluble nonwoven (midweight)—This soft and stable adhesive provides extreme stability when stitching. The release liner protects the adhesive, and once you are finished with the embroidery design it all washes away, even the adhesive. Transparent film (mid-heavyweight)—An extra firm plastic-like film such as this provides great stability and doesn’t stretch. Embroider directly on it to create lace and other free-standing projects. Water-soluble paper (mid-heavyweight)—Paper with an attitude. It is traditionally used for foundation piecing by transferring designs via copy machines/printers. It does not hoop well but is an excellent choice to top small embroidered letters. Adhesive transparent film (heavyweight)—Adhesive transparent film bonds to fabric without heat or spray adhesives and leaves no residue. Heat-Away Stabilizers are best used for fabrics that cannot be washed, such as velvet, satin, and some corduroy. Special techniques like making lace will use heat-away stabilizer as the designs are too delicate for other support options. Heat sensitive clear film (light-midweight)—Heat-Away stabilizers are removed when exposed to the heat of an iron. You may be curious how I keep all these stabilizers sorted. Once the packaging is removed, how do I differentiate between the stabilizers? The first product I enjoy isStabilizer Wraps. These bands come in packages of 16, wrap around the unused portion and it is easily customized with a permanent marker. Once I have everything labeled, I like to sort my stabilizer by type into this large ten pocket organizer. It hangs neatly behind the door in my embroidery and sewing space. 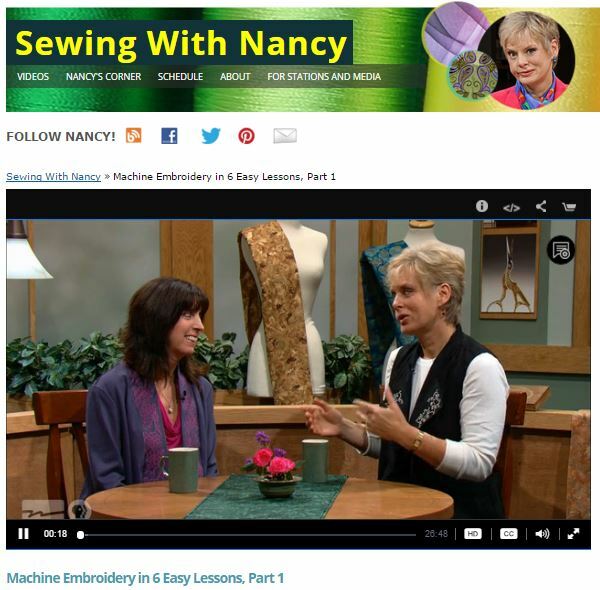 Watch Machine Embroidery in Six Easy Steps (Part One and Two) on Sewing With Nancy online. Has anyone tried using Terial spray instead of stabilizer? I purchased your Stabilizer book when it first came out. It has been a well-used resource for me and I highly recommend it. How far we have come since the coffee filters, freezer paper, adding machine tape! Guess I am showing my age! Thanks for the tips. I get so confused when I approach the rack of stabilizers in the fabric store! Great tips! I have a little organization tip to add… for those stabilizers bought by the yard and come with a plastic strip of instructions. I fold the plastic sheet in half and SEW down the two sides, leaving the top open. I can insert the leftover stabilizer; complete with brand/type/instructions that are on the bag. I also hate to waste stabilizer scraps. I have been known to sew them together with a longer stitch length to fit my hoop, or cover the hole created from an embroidery design. Thank you, Nancy, for this primer on the various types of stabilizers. Great information for one new to machine embroidery. How fortunate we are to have the availability of a multitude variety of stabilizers for each project’s requirements and for you, Nancy, to educate and provide the hands on knowledge we need. Always there for us, Nancy Zieman, thank you.